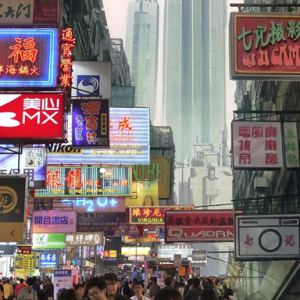 [Oshii] When I was in search of an image of the future, the first thing that came to my mind was an Asian city. 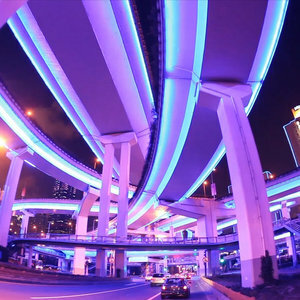 At first I did not think it was possible to create a perfect cityscape for the future; and what was done in the past seems unconvincing to me now…. 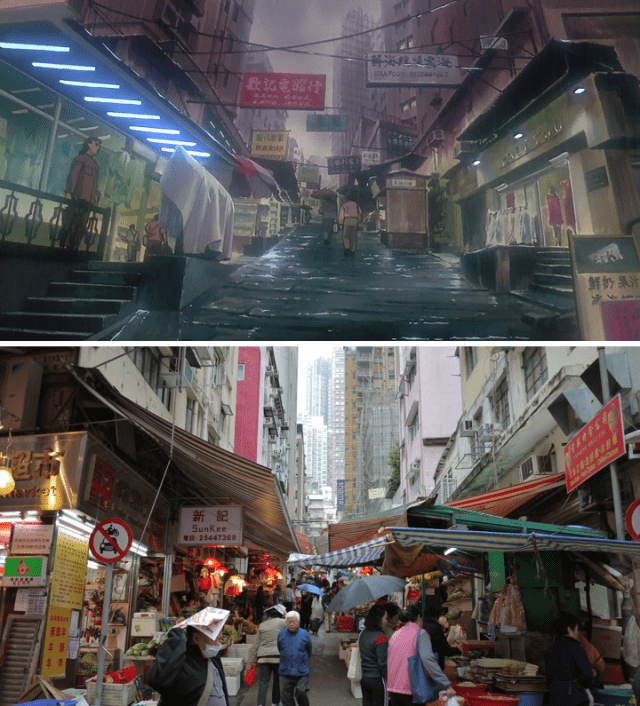 The only way, if one is to be true to the methodology of animation, is to use real streets as models, so I thought of Hong Kong. It is like the Los Angeles of Blade Runner; what has been achieved in that city set will be of use to later films. [Atsushi] Ghost in the Shell does not have a definite chosen set, but in terms of street scenes and general atmosphere, it is obvious that Hong Kong is the model. Such a choice has, of course, something to do with the theme: on the streets there flows an excess or a flood of information, along with everything this excess brings out. 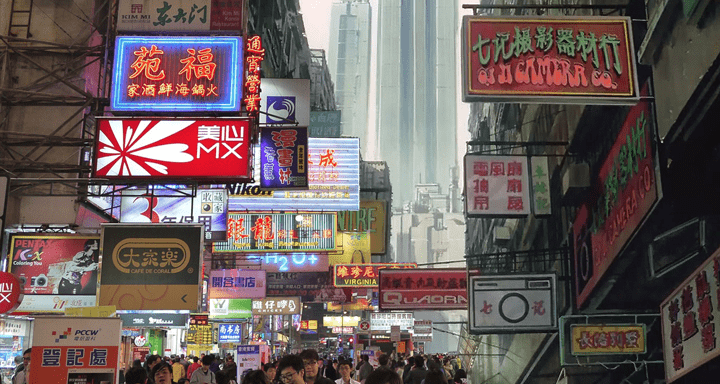 The modern city is swamped with billboards, neon lights and symbols…. As people live in this information deluge, the streets will have to be depicted accordingly as being flooded…. There is a sharp contrast between old streets and new ones on which skyscrapers are built. My feeling is that these two, originally very different, are now in a situation where one is invading the other. 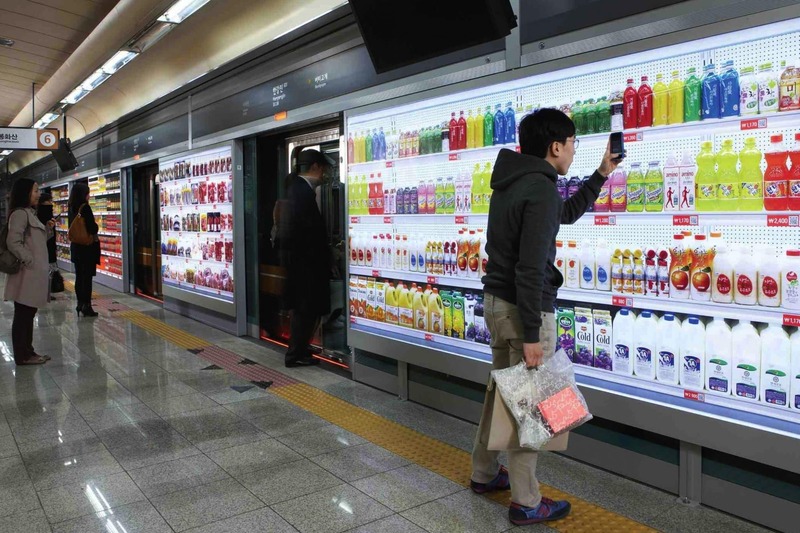 Maybe it is the tension or pressure that is brought about by so-called modernization! It’s a situation in which two entities are kept in a strange neighboring relationship. Perhaps it is what the future is. [Atsushi] In the midst of the profusion of signs and the heat of the messy urban space, the streets are remarkably chaotic. 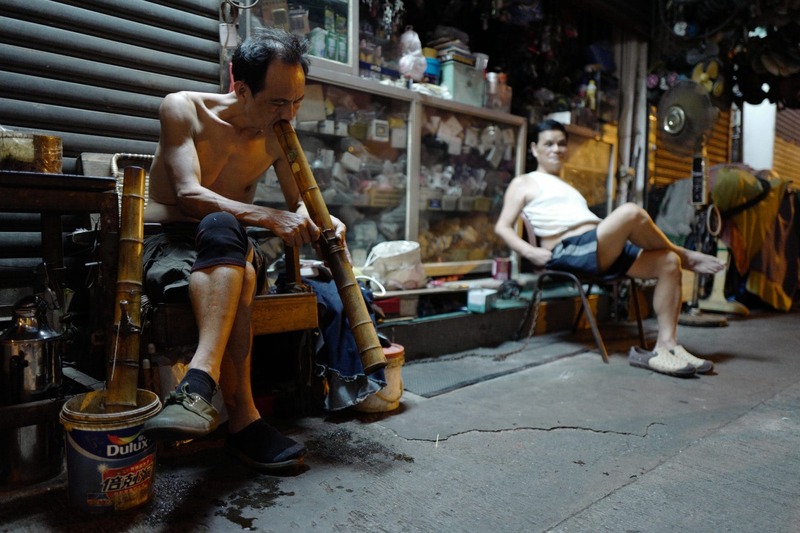 Passers-by, shouts, cars, all kinds of mechanical noises and human “sound pollution,” all merging into one, forcing itself into humans’ central nervous systems through their ears. But why do people succumb to this “destructive” environment? Now that the artificial has replaced the natural, humans are like animals in the past, deprived of the characteristics of being human as a whole. Pulled directly into the whirlpool of information through the stimulation of visual and auditory senses, their feelings are henceforth numbed. On the other hand, countless mutually interfering and uncertain data pass through cables at light speed. This is the way informatics continues to expand its domain. 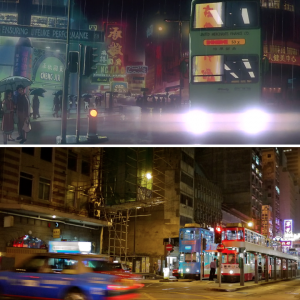 While the real Hong Kong may not be literally submerged in water (despite being surrounded by it), in nearly every other respect both the imagery and soulful mood depicted in the film mirror reality very closely – especially when contrasting the modern skyscrapers of Central with some of the older neighbourhoods in Sheung Wan and Kowloon. There is simply no other city like it. 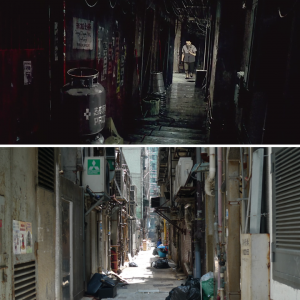 In many ways I feel that the intensity of living in Hong Kong has a numbing effect on its residents who try to insulate themselves from both the physical and mental demands of a city where money rules and personal space comes at a high premium. It’s no wonder that young people here struggle to get a foothold on happiness despite economic prosperity. 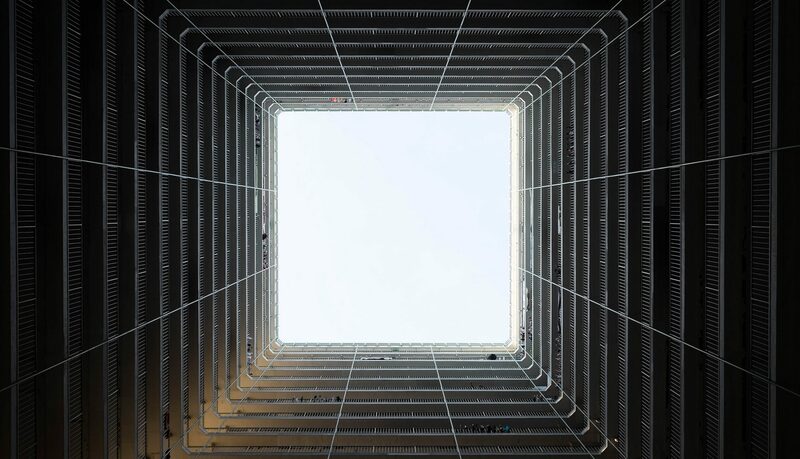 Hong Kong is the ultimate abstraction whereby our lives are no longer dependant on mother nature but on artificial life-support systems which feed off mass-produced assemblies of raw materials processed out-of-sight and out-of-mind. 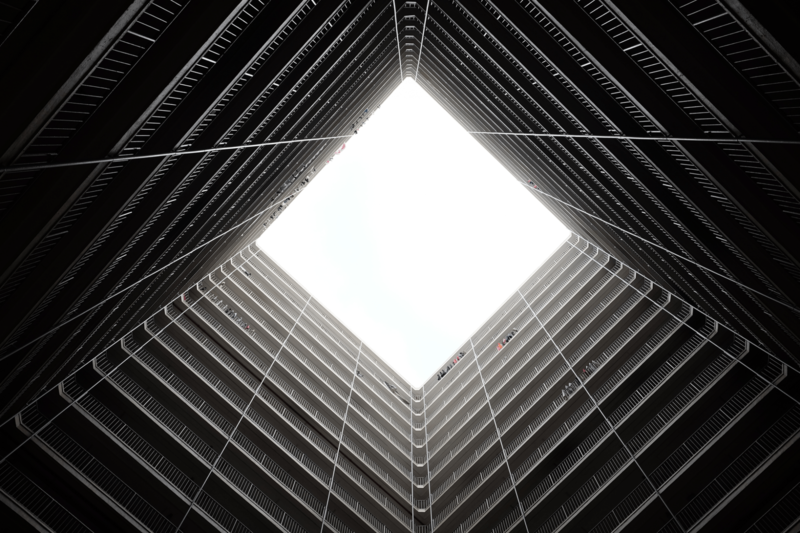 As a vision or model of a future city it’s both enthralling and frightening. Update (7/8): The reaction to this has been fairly overwhelming – many thanks to Tim Maughan, io9, Crunchyroll, Reddit (2), and Gadżetomania for the support! Great pictures, thanks ! Those sequences were definitely part of the highlight in the film. Wonderful article, for an amateur you got some very pro shots, frankly i’m jealous as i’ve tried to create something each time i’ve been there but other things hindered me. I did however take many photos, here is a link to a small selection i hope you find the time to view . Great shots but frankly I don’t feel the atmosphere of the original. First of all – maybe you should slow down the motion a bit. Secondly – all your shots are very “broad”, whereas in the original we see details: a specific person, a specific car, people looking at something (you got that right in that shot of a girl talking on the bus in front of you, yet still a bit too “broad”). Agree with what you’re – I’d love to do this again with more time and better equipment. It’s fairly rough-and-ready right now but I think gives a nice flavour of Hong Kong compared with GITS. I loved it. I love that piece of GitS, and I love what you did to replicate it. 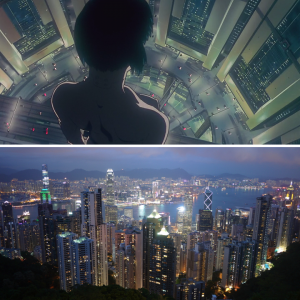 But what I thought was most different between the two clips, was that in Ghost in the Shell its so dirty. Everything is grimy, and run down. Like thats not whats important. Which gives it its Cyberpunk feel to it. I LOVE GitS and your video was an excellent example of what the original movie was trying (and succeded) to represent. I’ll add this blog to my blog’s links so I can get back and check your future (and past) posts. awesome video! 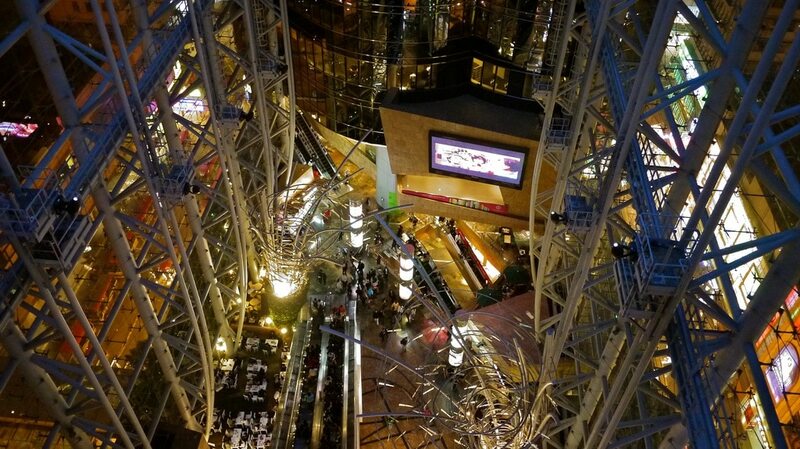 it does look close to the GiTS scene. you got lucky with the shot of the school(?) girls in the bus, if it was a bit slowed down, it would’ve been perfect. also, desaturate the colors slightly and it’ll get the melancholy look of the original in no time! 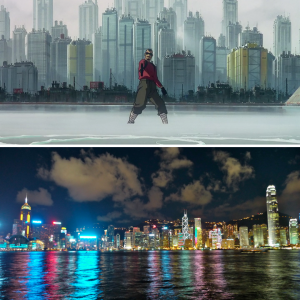 Did you delete the “GITS Hong Kong Mise en Scène” clip or did Vimeo delete it? Yes unfortunately it was removed but I have replaced it with a version from YouTube. Awesome, and thank you for this article! I’ve shared it with friends. Amazing shots David, truly! 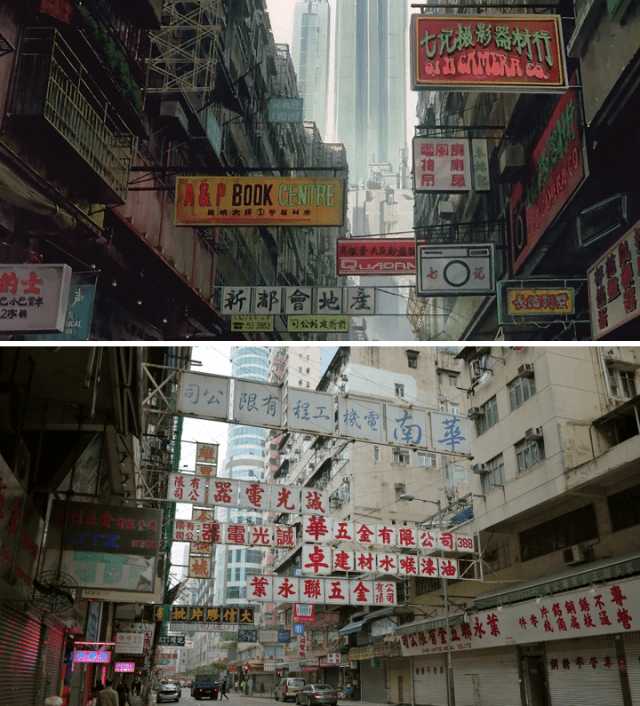 I was in HK this Jan while I’ve always been an incredible fan of GitS; and it was funny how, watching GitS again 2 months ago, it popped in my head that I unconsciously recognized scenes of the movie while I was wandering around. Your shots are really beautiful and look very close to GitS’, probably as close as they can get from what Atsushi had in mind. However, being an absolute crazy fan about it, I must comment on the 4th pic of your whole set and say that however you’d have tried, there was no way you could capture the essence of that precise scene. 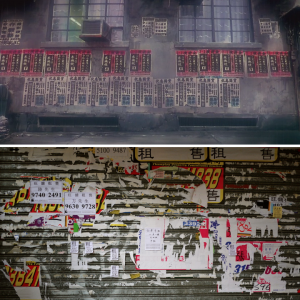 Do you know about Kowloon Walled City? 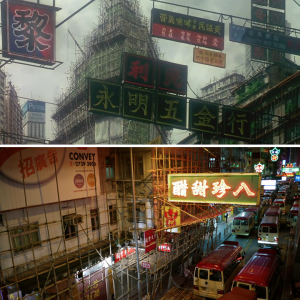 It has unfortunately been taken down some 20 years ago, but it has obviously inspired Atsushi on that scene. And it still inspires a lot of people, including myself. Great stuff all in all, I love your photos! Oh good one! 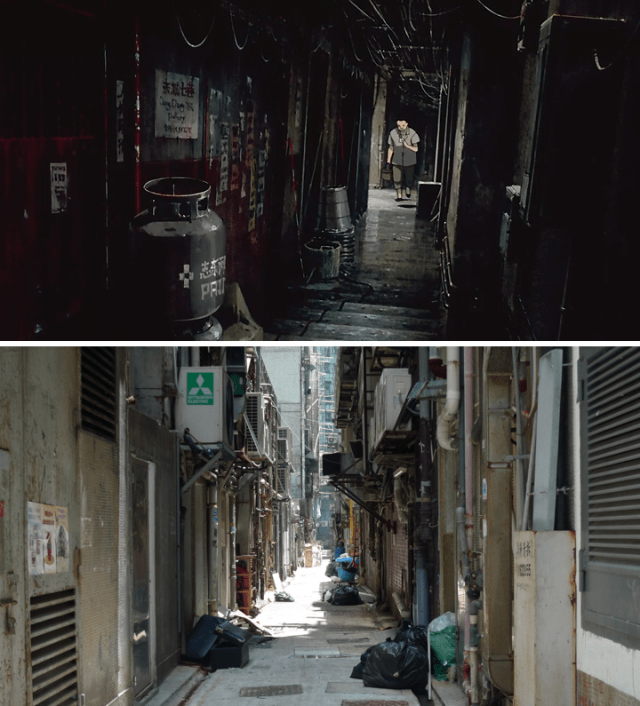 Great post about KWC and Hashima Island btw! Awesome video and pics! What a post! First of all I have to admit, I’m a big fan of Ghost in the Shell Anime 🙂 Used to watch it a lot few years ago and this brought some sweet memories back. 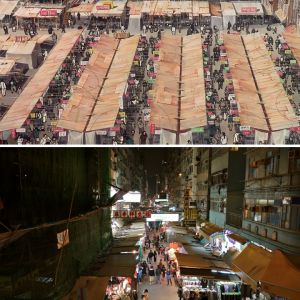 Secondly, I wanna make a video about Taipei like you did about Hong Kong.. I love it. How did you keep it so steady? You’re on a bus and there’s no shaking. Any tips? Thanks! I used a GorillaPod (http://joby.com/gorillapod) to strap the camera to the front of the tram – the raw footage was still pretty shaky but used the image stabilisation filter in iMovie to sort that out. Really nice video. Maybe a longer focal length lens would help create more selective focus and an even more filmic look – but no matter! Your new camera does a great job of night scenes – the wet streets giving reflections help make great night shots (a pro tip). I really liked the girl in the tram shot moving toward camera and the other moving tram shots – having a choice of lens might help make more of that kind of sequence. Also loved the skyline and ferry coming into frame shot – went really well with the music change – the whole film was nicely edited to the music. A brilliant film I really enjoyed. 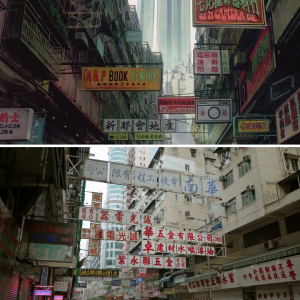 I came across your post a while ago when I was researching Ghost in the Shell and Hong Kong. I am practically trying to recreate the scenes from that YouTube video! Nice job Edwin – great minds think alike! That’s awesome Felipe – hope you have a great time there! This is an awesome post! 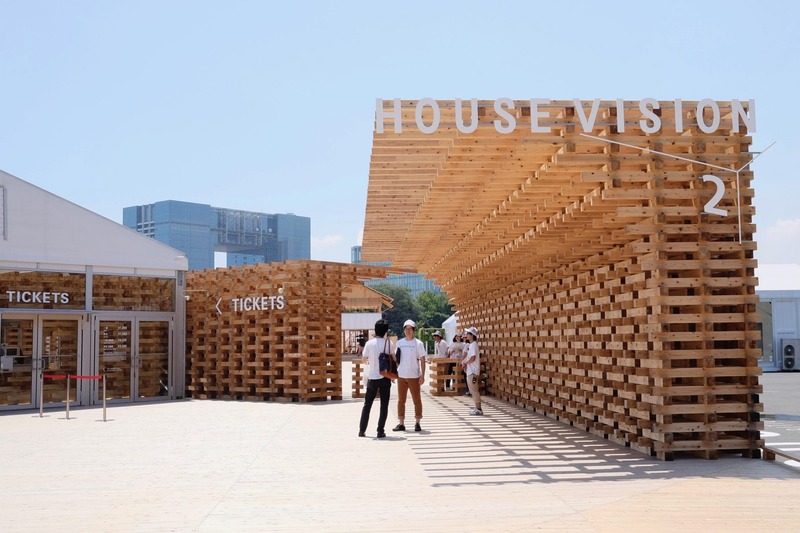 I’m currently living in Melbourne, Australia and will be travelling to Hong Kong next month for a short stop-over on the way back to my home in London. 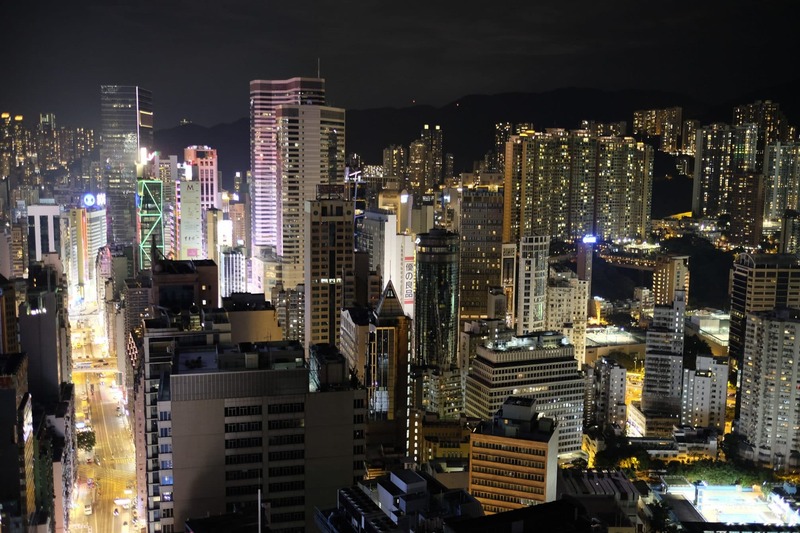 I booked the trip thinking ‘I don’t want to just fly home, maybe Hong Kong would be cool for a stopover’. 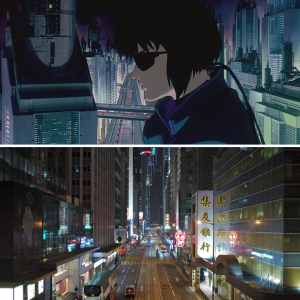 I am a long-time GITS fan and never made the connection with Hong Kong! Now, having read this post, I am itching to get there. Thanks so much; I’m going to do my best to visit the places you shot. Thanks Neil – hope you have a wonderful trip in HK! David: found this great, older work while doing some GitS stumbling recently, obviously due to the release of the ScarJo film. Terrific stuff you did here. 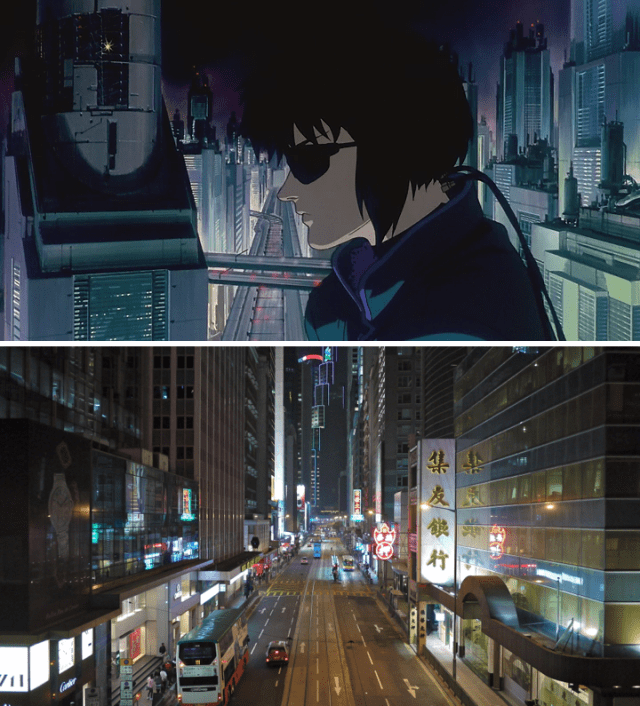 But this begs the question: have you seen the new film and what do think of HK’s look in it compared to the anime? 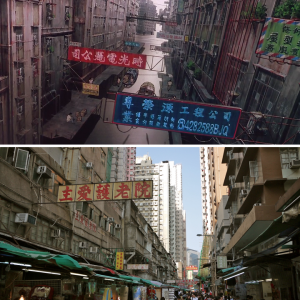 And of course, how do you feel about the changes to HK’s landscape since you took these original shots? cheers and thanks again for sharing your work! 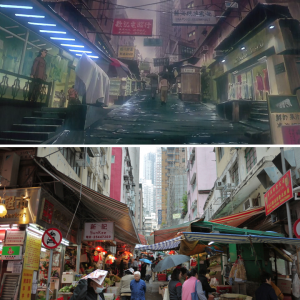 From what I’ve seen from the trailers it looks very faithful to the original anime and even though it wasn’t shot in HK they seem to have still use the same backdrop of copied elements from the modern city. I’ll report back once I’ve seen it in the next couple of weeks! and let me know what you think. Would also be interested to hear your thoughts on the new version!